Investors would all like to know if the Dow is trending up or trending down. How do we know? Simple. In the new era, the Federal Reserve Bank controls every aspect of our lives including stock trends. Certainly the Fed sets prices for everything including stocks. Forget corporate earnings. Almost all of them are the result of accounting trickery. The blog ZeroHedge put out a great chart of Bank of America. Their ‘earnings’ are completely dependent upon backing out GAAP expenses for legal fees incurred due the company acting with criminal intent to carry on its business. The company claims legal fees are ‘one-time’ expenses. Yet, the company has these ‘one-time’ expenses every quarter. Every single quarter. So, Bank of America uses non-GAAP accounting to pretend that if they hadn’t lost money due to the enormous legal fees necessitated by operating a criminal organization, they would have made money. They take the legal expenses and add these expenses back to the the income side of the ledger. So that’s accounting trickery. But alas, we don’t need no stinkin’ earnings for stock prices to rise. I don’t care if every one of the thirty Dow stocks declare bankruptcy in the morning. The stock price of every one of them would be higher by the afternoon close. Why? Because the Fed maintains their control over the world by conning the world with ever ascending stock prices. Okay, look at the chart below. This is the Dow year-to-date through 10/21/14. I marked the letter ‘A’ on the chart. This is the beginning of August and the Dow has just dropped some 700 points from its high in July. Why? The world thought the Fed was serious about terminating its QE program. No stimulus, no bull. Down went stocks. What turned the Dow index around? The Fed Chair Yellen popped out and told the world that QE might last indefinitely. Up went the Dow. See letter ‘B’. The Dow rolled over. Why? Fed Chair Yellen mused that she thought stock prices were stretched. Down went the Dow. See letter ‘C’. The Dow shot back up. Why? After Ms. Yellen tanked the Dow at ‘B’, she watched as the index lost about 1000 points. As the Dow touched the 16,000 line, Ms. Yellen sent lap dog Plosser or Bullard or one of those propaganda tools out to talk up the index. They said QE could last forever and interest rate increases were way far off. Up went the Dow. Interestingly, at letter ‘C’, Walmart said sales were stale and they lowered projections for the entire coming year. McDonalds said Q3 sales were down 3% in america and down 20% in China. IBM lowered expectations and consumer spending decreased for the first time all year. Of course, the consumer spending will be ‘revised’ soon to show a gain as the Fed continues to manufacture, write, and promote the news they need to justify their furtive filching of america. Of course, the Fed needs the populace to be brain dead so that has already been accomplished. The clown show continues. The Dow IS the Fed. The Fed IS the Dow. This used to be against the law. Americans used to have more respect than to surrender to a bankster mob that promises to goose the Dow when necessary. But not now. This is the new era. We no longer have to know anything to make money in stocks. When will the current rally fade? I’m sure the Fed will tell us. What will the next trend bring us? All we have to do is listen to the Fed. It’s as simple as A-B-C. Fear is defined by the ‘online dictionary’ as ‘a distressing emotion aroused by impending danger, evil, pain, etc., whether the threat is real or imagined’. America is in a permanent state of distress. America is in a permanent state of fear. Americans are, or must be, very fearful people. Why else would they surrender all their assets and all their liberties in exchange for some perceived protection? That perceived protection is a standing offer from the Federal Reserve Bank and its puppet, the US government. Then Fed President Greenspan usurped powers when he spread the fear of the Y2K computer crash in 1999. Americans cowered in fear. The US regime usurped more powers as they imploded the twin towers in 2011. WTC7 (not hit by plane or anything else external) followed with what can only be described as ‘spontaneous implosion’. Americans cowered in fear. They continued to scare americans with a boogeyman (Mr. Bin Laden) that wanted to kill everyone. Americans cowered in fear. Of course, when he died at the hands of a Pashtun war lord in 2003, there were more boogeymen introduced to the american public who were now cowering in a fetal position underneath their desks. Then Fed President Bernanke, after stating in 2008 that the threat of economic collapse had passed, usurped more power as he offered to save the economy of the world if he just had a few more legal options at his whim. Granted! Just keep the boogeyman away from us! Security, real or perceived, is expensive. Now america is nearly $18 trillion in debt and completely addicted to Federal Reserve stimulus and manipulation. Americans are also addicted to the idea of military prevention of eminent acts of, well, terror! What are the signs of america’s growing fear? I saw a financial show a week ago on which a panel of supposed ‘financial experts’ were discussing the collection of personal data by the NSA. All agreed it was a good thing because none of them were doing anything wrong. Besides, the NSA was protecting them from the boogeyman. Idiots! Freedom and liberty from the american government is the very thing that once made america great. Americans live in fear. When we go to an airport, we submit to being stripped or groped as if we were on a fourth date. Why? Americans live in fear. The stock indexes were all reflecting the recessionary conditions of a few years ago. When Bernanke and Paulson offered to save investors, everyone quickly surrendered capitalism and free markets to kleptocracy and manipulation. More fear. To the present, a report came out today that new home sales increased some 18% in August. That fabulous news lifted stock indexes around the world. Of course, as I have written numerous times, whenever we get a report that existing home sales were down in a month, we also get a report that new home sales were up for the same month. If existing home sales were up, new home sales were down. Now, what kind of mendacious, ridiculous, propagandist group comes up with this absolute dishonesty? What? Oh yes, there it is. The US Commerce Department released this data point on 9/24/14. Interestingly, KB Homes, a builder of such new homes that were selling like hotcakes according to the afore mentioned, and more accurate, DOPE (Department of Pathological Embellishment), said their sales were actually down during the third quarter. The only reason, other than grotesque, profound ignorance, that anyone accepts this obvious nonsense is that americans live in perpetual fear and cannot accept the truth. Fences. Fences have always been used to keep out unwanted intruders. They have also been used to keep subjects of ownership from drifting away. All of the terrible places to live on the planet are lousy because of their overbearing, power-hungry, kleptocratic governments. These governments propagandize fear of everything to their subjects. If citizens try to flee, they will likely find themselves to be incarcerated by some kine of fence. Or, should they attempt to scale the fence, they will likely be shot. This is a good sign that the government in control can only maintain control with the threat of a gun barrel (to borrow form Mao). North Korea would be a classic example. Interestingly, North Korea’s regime tells its subjects that the rest of the world is about to invade and kill them. Fear. Welcome to the new america. While the american regime lies to the public in the assertion that the Fed’s actions are not inflationary, the cost of renouncing citizenship is going up five-fold. The american regime is trying to prevent citizens from leaving. Fear is growing on both sides. There is a growing fence line on the southern border of america. Most people think the fence is to keep immigrants out. Most likely, when it is complete, the fence will be there to keep citizens from fleeing. There have been several high profile US corporations that have moved their headquarters to other countries. The reason is simple. The US has the highest corporate tax rate in the developed world. Corporations can save money by relocating to less taxing countries. Burger King is the latest example as they announced the purchase of a Canadian coffee company, Horton’s, and the relocation of their headquarters from Miami to Canada. The regime has responded by trying to impose penalties and restrictions on companies exercising free market intelligence. The US regime is trying to incarcerate corporations out of fear. Governments represent citizens. Regimes represent their backers only. Governments that work for citizens help to foster a positive environment that attracts business. Regimes work for their backers and therefore foster a negative environment for business. Business and intellect tend to flee. Governments welcome the competition. Regimes try to thwart competition. Ultimately, regimes have to resort to incarceration techniques to keep their subjects from escaping. Clearly, the US is a different country than it used to be. It is a nation of fear. Panophobia is defined as ‘an abnormal fear of everything’. The US should consider changing its name to Land of Panophobia. American leaders all talk about boogeymen. They try to keep the public in a state of eternal fear. We don’t want the banks to collapse! We don’t want stock prices to fall and in turn hurt our IRA accounts! We don’t want some religious crazy to jump out from behind a bush and blow us up with a bomb! Russia is after us! China is stealing our economy! The borders are sieves! The military had to go back to Iraq and Syria to bomb ISIS! They are coming for us! Run hide! Boo! Why all the fear? Simple. When paralyzed by fear, sheeple will grab on to anything that promises to save them. Therefore, the US regime has promised to corral the boogeyman. The US regime has promised to never ever never let another big bank or Wall Street firm fail. The Fed has promised to keep interest rates low forever since this supports bubbly stock prices. Everyone gets insurance. Everyone goes to college. Everyone gets fed. Stocks always go up. But, there is a price to pay. The bill is coming due very soon! Relax. There is nothing to be fearful of here. As I have written numerous times, the Fed has ‘calendarized’ the stock indices. Quarterly portfolio statements go out at the beginning of October that will reflect the returns of the third quarter. And right on time, here is the Fed. The chart below is the Dow for the third quarter, 2014. The Dow is the black line. The other lines are the XRT (retail ETF) in gold, F (Ford) in blue), UPS in red, and XHB (home builder ETF) in green. As we can see, the Dow index has performed better than the components of the economy that make up the Dow. For the period, home builders are down. Ford, the car maker, is down. Retail is down. Even UPS, the company that brings our purchases to us, is down. How then, can the Dow be up? Simple. As the Dow tried to sell lower in September, it suddenly enjoyed a great rally from nowhere because of nothing. It is, of course, the end of the quarter. Of course there is going to be a stock rally. The Federal Reserve will see to it! We wouldn’t want to get an investment statement showing that stocks went down, would we? Lest we be more fearful. Therefore, we have surrendered capitalism along with our freedom and dignity to the Fed so the stock indices will rise to infinity! Fear. And, this article is posted with two more wonderful rally filled days left in the month of September. But, I can confidently post this article because I know one thing. The Fed will make sure that the Dow does not fall at the end of the month/quarter. Oh yeah, I also know that america has been stricken with perpetual fear. No one even questions a stock rally anymore. See the chart. The DOPE (Department Of Pathological Embellishment), or as some people still prefer, the US Commerce Department, said retail sales grew in August at a .6% clip. Sectors that reported negative sales were department stores and general merchandise. Gasoline was the only other sector to report negative sales for the month. Yeah, I know. I should always give readers a chance to finish their belly-laugh when I even mention the US Commerce Department. The Nazis had their own propaganda department that they used to try and form public opinion. The US regime has what I refer to as the DOPE. Truth is meaningless and frankly despised by the US government and certainly all departments of the regime must do what they can to sell the citizens on the economic nirvana that the regime wants us to believe. Of course, it is kind of hard to believe retail sales rose when department stores and general merchandise retailers reported negative growth. What does the DOPE use for data? Okay, that was pretty funny. Data is not an issue here. Numbers are just numbers and the DOPE has no problem making them up. Personally I have always listened to the companies themselves that sell things to the public. The biggest retailer of all, Walmart, has not said that sales picked up. In fact, Walmart has reported seven straight quarters of declines in sales and foot traffic. The biggest restaurant retailer in the country, McDonald’s, just reported a sales decline. The parent company of Olive Garden is desperately trying to halt the restaurants declining sales. The DOPE even claimed that technology sales picked up in August. Tell that to Radio Shack who said on Thursday that they were headed to Chapter 11 bankruptcy. Interestingly, and bubblicously, the stock of Radio Shack leapt higher by 9% on the day! I could go on but who cares? Stock indices no longer seem tethered to fundamentals or truth or anything but Fed manipulation. The reason for all this is simple. The US is now ruled by an elitist group who are driven by political power. They have no desire, intelligence, or knowledge to affect positive changes for the populace. These elitists are slaves to the banks that own them. As such, war is good for banks because they loan money to the military machinery. Thus, the US regime tried to start a war with Russia in the Ukraine. They tried to start a war with Syria. Now they have succeeded by giving the gang known as ISIL birth. The key was toppling the governments in Iraq and Afghanistan and Ukraine and Libya and Egypt and …, well, where ever necessary to promote more war. And the US regime has the gaul to chastise Russia for annexing Crimea! This is, of course, just a ruse to further the Fed’s pilfering of the US Treasury so they can further enrich their bankster partners. Simply giving big banks immunity from law, natural economic force, and integrity should be enough. But no, the regime has to give them all the money too. Should the populace ever engage a brain cell, as unlikely as that is, there would likely be some resistance to the regimes actions. What do we do this week? First, this coming week is the last full week of September. The key to fooling all of the people all of the time (yes, Lincoln was dead flat wrong) is to keep the positive quarterly investor statements rolling. Statements will be going out to investors in early October so the Fed will make sure not to lose the third quarter’s paltry gains in the last week of the month. So, we should expect a stock rally to put lipstick on the pig of the quarter. At worse, the Fed will make sure not to allow much selling to pull the Dow below its June ending mark. Second, there is somewhat of a cease fire in Israel-Palestine and the Ukraine. Scotland voted to remain subjects of the UK so all is well geo-politically. Domestically, nirvana has taken control of the US economy. There is a new high mark for wealth, everyone that wants one has a job and everyone is making more money. Corporations are earning more money than ever before and they are doing so by not raising prices as evidenced by the zero inflation as reported by the DOPE. At the same time, Japan’s economy has flattened and China’s economy continues to slow. There is a slow recession building in South America and Africa is paralyzed by the terrible ebola virus in the western part of the continent. Europe is in a recession and the ECB’s response has been to give banksters more free money. Sound familiar? So, things look pretty positive for the coming week. The vitality of the US economy rests squarely in the hands of the Federal Reserve Bank. Chairwoman Yellen has been pretty clear, I think, in her affirmation that she will not allow any bank to suffer from a limitation to currency. The Fed will continue to support the banksters even as the current round of QE comes to an end. Ms. Yellen made it clear that the next step would in fact be to raise the fed funds interest rate but that time is far in the future. And, interest rates will rise very, very slowly. This is what will drive stock prices higher. Of course, Ms. Yellen does not know it yet but the Fed will, after they make the horrendous mistake of raising rates based on rosy economic data of which they themselves help to construct, turn course and bring back another round of QE. Lastly, we should all keep something in mind. Derivatives brought down the house in 2008 in part because Ms, Yellen’s predecessor, the Bernanke, began raising interest rates in a country already trillions in debt. Big banks all have more derivatives now than they did then. Typically, derivatives are interest rate sensitive. When rates rise, derivatives kick in. Fortunately all the derivative issuers have insurance to back up their derivatives that they would likely have to pay out in the event of a rate increase or two. Unfortunately, none of the insurance companies have enough money to cover the derivatives they will be required to pay out. Uh-oh! Now who is the real DOPE? Fungible Truth therefore, is the interchangeability of facts. Of course, in today’s world, there really aren’t any ‘facts’. We live in a new world in which the truth must be so horrible, so despicable, so vile, so repulsive, so true, that it cannot be spoken. Nor can it even be fathomed. Well, except here. And of course, the financial page the Market Oracle from the UK. The Market Oracle is the only web page that has the guts to print the truth. Don’t bother with the rest of them. Reporters of facts have all become repeaters of propaganda for the regime. So what do I mean by ‘fungible truth’? As we all know, the regime is busy selling us on the economic recovery. The regime reports data to back up their sales pitch. This past week we have been getting deluged with reports from the regime pointing to the improving employment situation. All states, all communities, all over the country are reporting better than average job creation and lower than average unemployment. Mathematically this is of course impossible. If we were to average 2 and 4 we would get 3. If everyone was above 3, where did the 2 come from? Okay. So there is the first fungible truth. Next, news headlines are reporting the improving economy as evidenced by the wonderful jobs news. Nevermind that new jobless claims just increased last week. Nevermind the truth. The regime didn’t like the real number so they replaced it with a more palatable number. Fungibility. The regime’s number fits their narrative. The public accepts the regime’s number partly because the public, well, the public is like Stevie Wonder in a paint store, and, most importantly, the regime’s numbers make stock prices rise. There was even a headline that noted the reported job creation was proof that the economy of Texas was getting stronger. Ditto for California. Now, this struck me as odd given that the Deere company, maker of farm equipment, just reported weakening sales resulting in layoffs. Deere sells farm equipment. Texas and California are farming states. The IT company Cisco just reported weak sales and layoffs totaling 6,000. Yes, business is good! Sure it is. Should we even talk about Walmart? The company reports that foot traffic in existing stores has declined for 7 straight quarters. Sales are weak. JC Penney saw their stock price jump because they only lost $.73 cents in the last quarter. Yes, the stock price rose because expectations were for the company to lose even more. Just about every retailer that I know of has reported weak sales. Yet, the regime continues to stick by the fungible truth that consumers are spending more and more. If that is so, then consumers aren’t spending extra money at retailers. I suppose they are lined up at busy malls on Mars. Again, retail ‘sales’ figures are indeed fungible. The regime claims that consumer confidence is up (whenever they need a stock rally) yet a poll was out reporting that 75% of americans think their children will be economically worse off than previous generations. Fungible truth. Or maybe, fungible truthiness. Finally, Fed officials are trying to ‘talk down’ the fear of rising interest rates. Their message is that the economy is still fairly weak and interest rate hikes are far down the road. Again, as I have written, as I have written years ago, interest rates are not going to rise. Does Japan ring a bell? The central bank of Japan took interest rates to zero more than two decades ago. How did that work out? Are rates rising in Japan? Are rates going to rise next year? Are rates going to rise in the next century? No, of course not. Saving bankrupt banks comes with a heavy price to the society who gives up their Treasury for this purpose. Sadly, the result is the extinguishment of truth. American people are constantly lied to about literally everything. American leaders must themselves be pathological liars to even hold office. So be it. Investors need to understand that every piece of data they read or hear is communicated to support a story. The result is that the economy becomes a bubble because no one knows the truth. This week in August gave us a good example of the bubble. On Thursday, home sales were down 2%, unemployment claims rose to 311,000, Walmart cut future earnings expectations, war raged across the world (including Ferguson, MO), and yet the Dow rose 67 points. Isn’t that all that matters? Everyone has an opinion as to whether or not US stock indices are in a bubble at the present (July, 2014). Given a moment’s reflection, I came up with ten reasons US stocks are indeed in a bubble. 1) Fed Chair Yellen expressed concern in mid-July (2014) that certain asset classes appeared to be stretched in terms of valuation. The three that she mentioned were social media stocks, biotechs, and small caps. This is a bit disturbing on several levels. First, Fed people are bankers and not economists or investment experts. As bankers, the Fed only knows one thing. That is, they have the power to steal money from a sovereign Treasury and give that money to their banker friends who help the Fed to control the world. Second, Ms. Yellen may indeed be correct. Maybe the asset classes that she mentioned are at least expensive if not bubblicious. Third, the Fed no credibility for anything other than being a master manipulator of asset prices that results in wealth inequality. In other words, the Fed and their bankster friends get all the wealth and the rest of us get all the work. It seems to me that Ms. Yellen is free to voice an opinion concerning valuations but once inclined, Ms. Yellen needs to look at the biggest bubble in the history of the world - the US Treasury bonds. Yet, this is the very asset class that Ms. Yellen and her predecessors have worked so hard to manipulate into a bubble. And oddly, there is no one in the solar system that would argue against this. Does Ms. Yellen not see a bubble in Treasury Bonds? Is Ms. Yellen trying to misdirect our attention from the Fed’s own personal bubble? Does Ms. Yellen think we are all Pelosi’s? Yep, we are in a bubble. 2) Greece is still borrowing at about 8%. Jamaica is about to issue government bonds and it is estimated that they will carry an interest coupon at about 7%. Argentina is still borrowing. Greece is broke and in a permanent depression due to their ECB life support. Jamaica has defaulted twice in the last three years. Yet, they still borrow at only 7%. Argentina is currently in default talks with a US hedge fund. And further, the US is currently borrowing at 2.5% while the Treasury is $17.5 trillion in debt with no hope of ever repaying any of it. When broke, bankrupt, defaulting governments borrow at less than 10%, we might be in a bubble. 3) Q1 US GDP was reported to be down 2.9%. 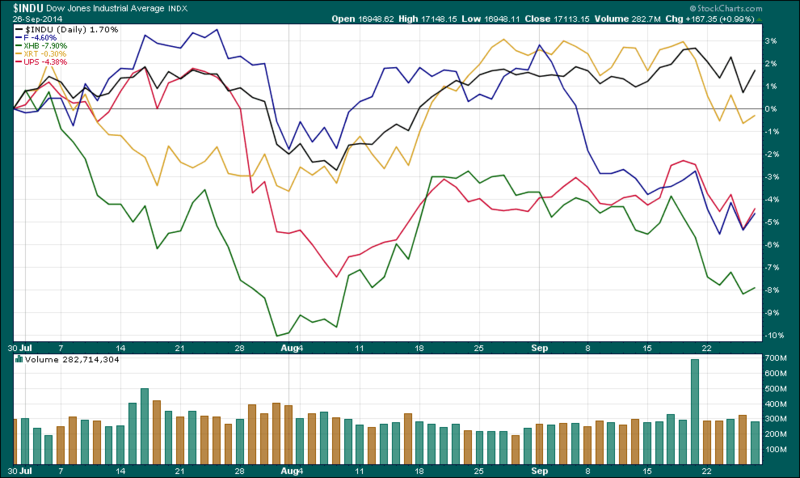 To date, the major US indices are positive for the year. Given that GDP is merely a function of money velocity times money supply, and given that the Fed that has been producing money supply is now cutting back, there is no chance that GDP could possibly pick up enough to justify current stock valuations. Yep, we are in a bubble. 4) The stock price for AMZN is over $320 and Amazon has no P/E because it has no E. The company just recently reported more losses. Why is the price so high? Because Amazon is the sixth largest holding in the Nasdaq 100 and represents 4% of the index.Yep, we are in a bubble. 5) Speaking of the Nasdaq 100, the index is up 11% year-to-date as of this writing. The idea is that the rest of the world is mired in a no growth economic environment. Therefore, the transnational companies will suffer as they do business with the rest of the world. Smaller companies that make up the Nasdaq don’t have as much international exposure so they should have an earnings advantage over their Dow brethren. However, the logic breaks down as the Russell 2000 is down 2% over the same time span while emerging markets are up 8%. Don’t try to understand it. We are in a bubble. 6) The death of Apple. Yes, we are witness to the destruction of one of the great companies in the world. If readers use Mac computers, they know the advantage of these machines. However, if readers have upgraded to the new Mac operating system known as ‘Mavericks’, they have seen the beginning of the end. It seems that something has gone terribly bad at Apple for them to put out pure garbage. Mavericks is so bad, that in my opinion, it is, and pardon me for using profanity here, but Mavericks is so bad that it feels very, well, Microsoft-ish. Unless Apple trashes this piece of garbage, fires every person connected with it, and quickly comes out with a more Apple-like system, the company may be doomed. Yet, the stock price continues to rise. Yep, we may be in a bubble. 7) Since June 1, 2014, gold is up 4% and gold miner stocks are up 20%. Given that the Fed will continue to withdraw stimulus, the dollar should continue to strengthen. Stronger dollars usually work against gold prices. Will miners continue to rally? Yep, we might be in a bubble. 8) Caterpillar and Joy Global make mining equipment. Both reported slow sales and both gave no expectations of a revival. Both report that business is slow and not getting better. Yet, miners still rally. Yep, we might be in a bubble. 9) Economic data has been replaced by economic propaganda. Good news is followed by bad news. Bad news is followed by good news. That way, investors just stay confused. For example, we were told in July that existing home sales were up. New home sales were way down. Next month, the regime will reverse that news. Existing home sales will be down and new home sales will be up. This will be announced in spite of the most recent data that contracts were down. Truth doesn’t matter to a liar. Likewise, durable goods orders were up in July. However, the previous increase for the month of June was revised to a negative. Good news, bad news, good news. It’s just news. It’s just propaganda. No of us can handle the truth. Yep, we might be in a bubble. 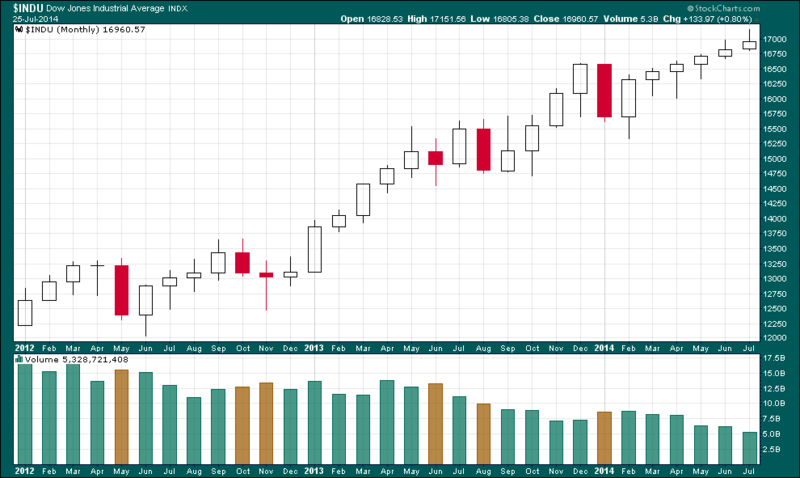 10) I have included the chart below that shows the Dow over the previous 2.5 years on a monthly basis. We can see the non-stop ascent of the price of the index. We can see that there have only been 6 negative months during the period. Several of those were only mild declines. Since the Fed has come to the rescue of equities time and time again, investors have clearly decided that there is no risk in stocks. Ms. Yellen chided investors for not respecting risk. However, this is like Santa Claus bringing toys to us every Christmas morning and then chiding us for expecting such gifts. If Ms. Yellen would like investors to respect risk again, maybe she shouldn’t show up on Christmas Eve. But one thing from the chart below should be a major red flag. That is, the Dow index continues to move higher and higher as the volume of trading continues to move lower and lower. There are many reasons for this and the main reason is that the Fed has implemented the PPT strategy so often that they have convinced would-be sellers of stock that selling stock is a losing proposition. The Fed stands ready to bring pain to sellers. Every morning at 10:15am the Fed commences with its POMO activities. They conclude such activities at 11am. Stock prices always rise during this period. Only buyers remain. At any cost. At any price. Take away sellers and stocks will always rise. Yep, we might be in a bubble. Fed Chair Yellen spoke a few days ago and I have been laughing ever since. Ms. Yellen commented on the state of investing and cautioned investors against getting too complacent. She opined that investors were not respecting risk like they should. Yeah, I know. Readers probably need a moment or two to compose themselves after a hearty belly laugh. Me too. The Chairperson of the Federal Reserve Bank thinks we are discounting risk of asset price declines too much. Seriously? I guess she is serious. This is like Santa Claus cautioning against children becoming too expectant of receiving toys on Christmas morning. Of course, if Santa didn’t show up every Christmas Eve night and deliver toys to children they would not be so expectant of the gifts. And so, if the Federal Reserve Bank wouldn’t show up every single day of the week at 10am to boost stock prices higher we investors wouldn’t be so ebullient about ever ascending prices. Risk? There isn’t any. Why should any of us even give risk a thought? Stock prices are not only headed higher, but they are headed to the very top of the bubble that the Fed has once again blown. Should the Dow Jones Industrial Average drop 100 points at the open of trading on any given morning, we all know beyond a shadow of a doubt that the Fed Bank would be right there to arrest the selling and turn the frown into a smile as we watch the magic. By noon, the 100 point loss would be turned into a 100 point gain. The PPT would go into action. The Fed’s own POMO would be busier than the ‘global warming’ crowd blaming warmer temperatures for the growing sea ice in the Antarctic. The new US nanny state is home to the nanny stock indices. For instance, the Fed needed a little ‘good’ news to push the Dow over the 17k mark. And so they got it. Supposedly, the US economy created 288k new jobs. Sure it did. Really. That’s what the Labor Department said. Of course, within the report we can see that half of those jobs came from retail and hotel/leisure. I even read one government propagandist writing that retail jobs average $17 bucks per hour. Really. I read that. Aren’t these the same people that the Obamanistas keep trying to help by raising the $7.25 federal minimum wage? Doesn’t sound like they really need help! And of course, part-time jobs showed an increase as well. But whatever. Who cares about truth? The economy created nearly 300k new jobs and stocks rallied. On the other hand, had the jobs report matched the first quarter negative GDP and shown that no jobs were created, the Dow would have plunged. No worries. Santa Claus would have been there to stop the selling and then magically drive the Dow to new heights. Uh, I mean the Fed would have stepped in. And Ms. Yellen wants us all to pay more attention to risk. That’s hilarious! I have to give Ms. Yellen a shout out since it appears that she may rival the Pelosi in intelligence. As readers know, Ms. Yellen reminds me of the bumbling Aunt Clara character from the old ‘Bewitched’ TV show. So let me help Aunt Clara out in getting investors to respect risk. Hey Aunt Clara! Put a stop to the current QE program immediately. Then, the next time the Dow has a negative start to a day, tell the PPT to stand down. Send the POMO criminals home. Let the Dow go where we investors think it should go. Allow investors to discover real stock prices. I’ll bet every investor would suddenly respect risk again. But readers know this isn’t going to happen. In fact, my last shout out to Aunt Clara was obviously heeded. On May 23, I had to holler at Aunt Clara that the Russell 2000 had sunk into bear market territory. No sooner than I had my blog posted, shazaam! The Russell 2000 is no longer in bear territory. Just a scant month later, the RUT has turned positive for the year! Shazaam! Below is a 1-year look at the RUT on a weekly basis. Since Ms. Yellen was given the memo of struggling stock indices in late May, they have all gone straight up. Check out the chart. Notice the blue line. That would be the 28-week EMA. Again, when Aunt Clara sees an index dip below this line, she conjures up a rally. Of course she needs a little help from the criminals on Wall Street and the criminals in the bankster world (you know, the guys that have been fined a $100,000,000,000 dollars so far this year for all of their criminal activity) but since we no longer care anything about the truth, that is not a problem. Check out the chart below and have a good chuckle over the holiday weekend! While Rodney made a joke of it, we now find ourselves living in an era of no respect. One definition of respect is ‘to avoid violation of or interference with’. With the NSA listening to our phone conversations and reading our emails, the US regime has clearly descended into an attitude of disrespect for all citizens. Soon, drones will be buzzing around overhead keeping a watchful eye over our every move. Why? Because the government no longer respects the governed. The framers of the US Constitution felt so strongly about setting boundaries of government control that they immediately amended their document to include ten more specific guidelines concerning individual freedom and liberty. These are known as the ‘Bill of Rights’. They included freedom of speech, gun rights, and judicial rights. The current regime is trying to erase them all one-by-one. Why? Because the government no longer respects the governed. For instance, if someone were to ask us for some privacy, we would all remove ourselves from the area and allow the person to do whatever without us watching or listening. That is nothing more than common decency. It is basic human respect. Yet, the US regime is intent on ruling over us while watching our every move. Why? They are the elite. We are the subjects of their rule. The government no longer respects the governed. Maybe this is why there is so much strife in the world today. Governments no longer respect basic human dignity of citizens. In return, citizens should extend the same respect, or lack of, to their governments. Again, maybe this is why so many regimes are ceding to rebellion. Witness Albuquerque, New Mexico. I have been writing about the police and their murderous Gestapo tactics as they continue to gun down unarmed citizens in cold blood. The latest case to be adjudicated was the case of a mentally disturbed man who was gunned down in his own back yard by the police. The officers were fired and the city was sued for $6 million dollars. For the crime of murder, the city of Albuquerque will have to $6 million dollars for the behavior of these police officers. Where is the respect? Witness Wells Fargo Bank. They have recently been fined some $10 billion dollars and then some for all of their crimes committed over the last decade. The CEO was just rewarded with a salary of $19 million per year. So I have to ask. If the proper restitution for murdering an unarmed citizen in cold blood is just $6 million, then indeed what kind of heinous act of criminality warrants a fine of $10 billion dollars? What did they do? Did they murder thousands of unarmed citizens in cold blood? No, but they, along with the other members of the big banker criminal network, no doubt ruined the lives of countless citizens around the world with their criminal activities. Of course, the banksters were all given trillions in Treasury money that came from the pockets of the individuals that were bilked and conned by the banksters. And of course, this was all sanctioned and orchestrated by the Federal Reserve Bank. On a criminality scale, where then does the Fed fall? Where is the respect? The answer to the respect question is of course, ‘there is none’. Governments think they can do whatever they want to do. Banks think they can do whatever they want to do. Goldman Sachs, for instance, just inked a deal with Ecuador in which the two will swap gold for US currency. Goldman gets Ecuador’s gold and Ecuador gets Goldman’s money. Ecuador uses US dollars as its own currency because they are too stupid and callous with their own compunction to print money which results in the ‘Zimbabwefication’ of currency. It becomes confetti. Anyway, in three years, the two will swap assets so that Goldman will wind up with the money and Ecuador will wind up with their gold minus any price appreciation over the period. This tells us that the price of gold will not rise by the end of the next three years as Goldman Sachs would take a loss if that were the case. Clearly the US regime and the US Federal Reserve Bank will not allow for Goldman Sachs to lose money. Yes, Goldman bankrupted themselves a decade ago like all the other big US banks. But now, they have the Fed on their side. Goldman was given bailout money to restore the company to its parasitic state so it can again feed off the greed and stupidity of mankind. Ecuador is doing the deal because, like the US and every other sovereign nation, they are broke. Since Ecuador uses the US currency as their own, they can’t print any of it up. Now they are broke with an expanding deficit. Here comes the parasite. Where is the respect? It then follows that as governments no longer extend respect to the governed, the same governments no longer extend respect to capitalism. The creator of wealth. The ladder of affluence. The opportunity of growth. No respect whatsoever. They spy on us. They regulate us to the point where we are bound and gagged. They lord over us with laws that prevent almost everything, unleash regulators with mandates of tyranny, and enforce and protect their kingdoms with para-military police. The governed no longer control the ‘elected’ governors. It is, the other way around. 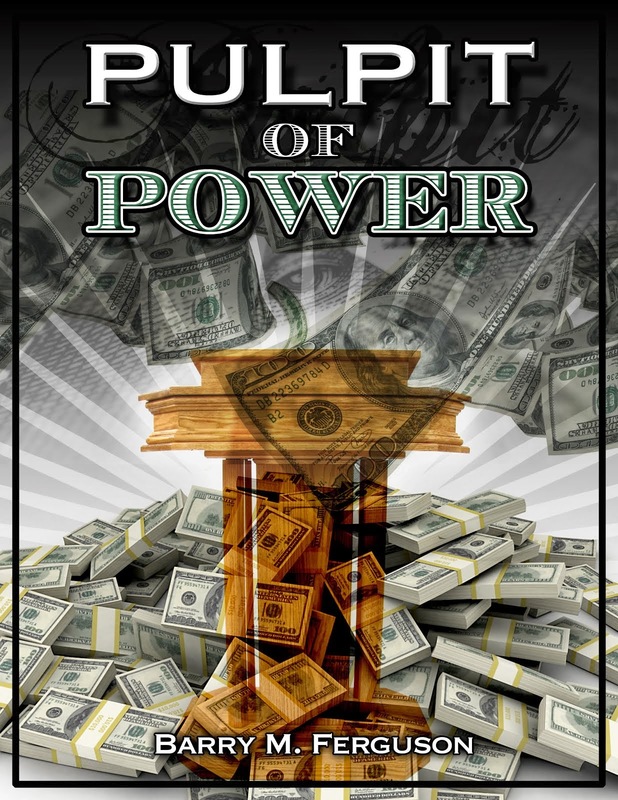 Governments have in fact ceded all power to the central bankers. It is their intent to loot the treasuries of nations and wallets of the governed so that the elite banksters can have it all. Good for them. Meanwhile, revolution is either in the streets or brewing in hearts of the governed. Except of course, america. Maybe ignorance does not justify respect? America will soon find out where ignorance and apathy lead. Investors, of course, still need to invest. Clearly the worst decision would be to ignore equities. Clearly the central bankers exist only to protect the very rich. They own stocks. Ergo, stock prices are going up. Witness the latest data. Housing permits are negative. Consumer spending is negative. Car production is negative. US Q1 GDP was negative. Yet, government data points like ‘leading economic indicators’ are now up (as of this writing) for the fourth straight month. The Federal Reserve just met and agreed that the US economy was indeed gaining strength. Stock prices are up so far this year so that proves the government to be right. Let’s review. GDP is expected to regain its growth trajectory. Maybe. However, the IMF just lowered expected economic growth expectations for the US. The same body also joined the chorus calling for the US to raise minimum wages. Somehow, the IMF thinks that higher wages are the path of economic growth. These bankers do not understand that higher wages are an effect of better economic growth and not an instigator of such growth. But again, the real reason the elite are calling for higher minimum wages is that they know that higher wages in the hands of the lower end of wage earners will result in them squandering the extra money that will then wind up in the hands of the banksters. That’s what poor people do. They squander resources. But I digress. The point is this. Every real world data point indicates a slower economy going forward. The Fed says things are picking up. Therefore the economy will pick up. The Fed says so. And, they are going to make sure we all know that things are getting better by virtue of a rising stock market. And, they will start writing the positive economic data to back their assertion. So what do we buy? I have been urging investors to buy the most bankrupt asset they can find. In bubbles, the stinkiest garbage rises the most. Central bankers want to convince us all that there is no longer any risk whatsoever in stock indices. The volatility indexes will verify this but there is in fact no longer any risk in stocks. To prove it, garbage is rising faster than anything. I have been recommending Greece and so far in 2014, the Greek stock indices are besting US indices. Now I think we should turn our attention to Argentina. Not only are they broke but they are in the process of defaulting on their loans. Readers may not be believers so I included the chart below. So far this year, Argentina is besting the US indices as well. Where is the respect? The chart below is a year-to-date (as of 5/23/14) look at 10-year US Treasury prices in green and the Russell 2000 in blue. Clearly the better investment so far has been Treasuries. The 10-year is up 2% so far while the Russell is still down over 3% for the year. We must ponder. If the economy is so good (as the US regime claims), then why are US stock indices either down or flat for the year while Treasury notes are up? Look at the chart and then read on. While we can’t argue with the chart, we must strive to understand what the chart is telling us. As most readers know, almost all investment pundits have been calling for a rise in interest rates. Pundits are invariably completely ignorant repeaters of stories they do not understand. I wrote an article in 2010 detailing the reasons that all US Treasuries will eventually yield nothing. I am led to this conclusion by the truth. Hey, come back. I didn’t mean to scare american readers with the truth. God knows that one could chase the average american to the other side of the Sun with the truth. But please readers, pull your skirts up, put in a mouth piece, and learn the truth. Here it is. The US government (taxpayers) are $18 trillion in debt already. What will rising interest rates cost an already bankrupt country? Spain leads the world in home ownership. 92% of their mortgages are of the adjustable rate variety. The unemployment rate is nearly 30%. What will rising interest rates do to the Spanish economy? Housing in the US is, well, whatever we believe it to be. God knows the US regime is completely incapable and totally unwilling to tell the public the truth about anything. But I think we could all agree that housing is not yet robust. Housing starts are still barely a third of what they were ten years ago. 30-year mortgages are now averaging about 4.1%. If housing is not strong with borrowing rates at 4.1%, what will it look like if interest rates rise? I could go on and on but one would have to be an ignoramus of Pelosi proportion to even entertain the notion of rising interest rates. They can’t go up. It will not be allowed. Ah, there is the key word. ‘Allowed’. We must all recognize that there are no longer ‘markets’ of any kind that allow participants the liberty of price discovery. Ah, there is another key word - ‘liberty’. No, no, no. The Federal Reserve Bank now sets prices for everything that the rest of us are too stupid to determine for ourselves. Or, the Fed sets prices because they are both fraudulent in their operation and criminal in their intent. The Fed ‘allows’ us to do things since they are the master and we are the slave. As for the chart, we must look beyond the lines. For instance, a large institution sold more than $141 billion in Treasuries over a one-week period (as reported by Dr. Paul Craig Roberts) earlier this year. Since selling Treasuries can push interest rates higher, the Federal Reserve stepped in to purchase these bonds. Only, they did it through Belgium so as not to alarm anyone as to the Fed’s fraud. 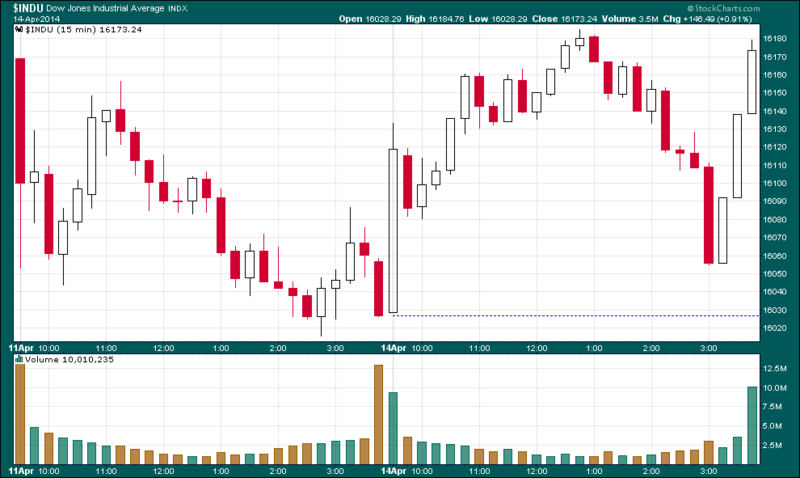 Obviously, heavy selling makes the line on the chart fall and heavy buying makes the line rise. To be clear, there is no longer a ‘market’ of buyers and sellers setting prices. The Fed steals money from the Treasury and buys assets as they see fit. Therefore, we cannot completely trust the lines on a chart unless we know the truth behind those lines. The Fed carries on their criminal intent by deceiving the rest of the world. As completely expected, the next day Fed Chair Aunt Clara flew into action. The Russell has been the big gainer over the last few days. Go figure. The key is no longer to know anything about investing or stocks or fundamentals. The key is to know what the criminals are going to do. Clearly the criminals that perpetuate the farce of an economy that we have want to protect their portfolio. The Fed has over a trillion of our stolen money, or credit, in Treasuries as they continue to manipulate interest rates lower. They are not going to let Russia or anybody else sell Treasuries, drive up rates, and destroy the Fed portfolio. Interest rates will continue to fall. 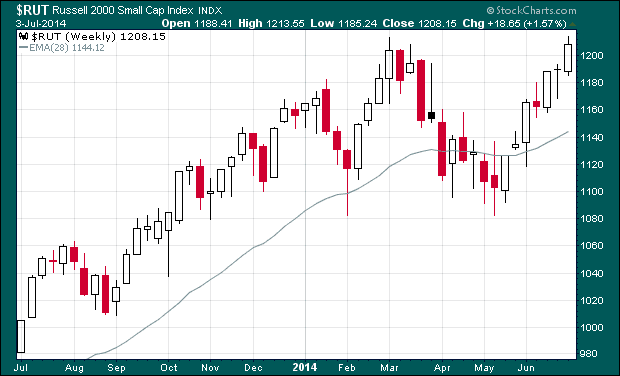 The Russell will likely catch up to the Dow and then move beyond as momentum kicks in. No, there are no longer any markets. We are now witnessing a game of 3-card Monty and we have to decide on whether to bet on the shill or the mark. And just for clarification, Wall Street is the shill and america is the mark. If Treasuries are speaking to us, they are using sign language. What the media tells us and what the charts tell us is not the whole truth. We must understand what is behind the lines. Chart lines are drawn by trading activity but we must know that these lines are now puppets of the Fed. While the charts may imply a particular meaning, we must understand the real signing that is going on. The Fed is now using chart lines to keep us in check. Aah! There they are. I was worried that the Plunge Protection Team (PPT, or, if one prefers, The Presidents Working Group on Financial Markets) had forgotten their job. The PPT exists so the Fed can drive stock prices to the moon. Generally, the PPT comes into the fray in the final hour of trading on the NYSE to buy stocks up in an attempt to arrest a stock sell off. I prefer to define a PPT attack as the Dow rallying more than 100 points per hour. To be sure, the Fed has done a wonderful job of pushing stock prices higher on a nearly everyday intervention basis. For sure, nearly every week and surely every month of the last year or so has seen a constant 45-degree ascent. The PPT has not been a necessary part of the overall manipulation. But then, the month of March ended with losses showing up for the Dow for Q1 of 2014. Yes, the Fed was there at the open of every trading day since mid-March with a fistful of money to buy stocks higher. They managed to get the Dow almost back to even for the year. With Q1 client portfolio statements safely in the mail, the Fed, as they always do at the beginning of a quarter, took a break. Not surprisingly, as the month of April unfolded, the Dow began a nasty descent. Apparently falling to just above 16,000 was the line in the sand. As trading opened on Monday, April 14, 2014, the Dow sprung from its selloff of the previous Friday and leapt higher in the first hour of trading. Hello, Fed! Then, and since most investors are beginning to realize that stock prices are in a bubble, the Dow began to again roll over. Lower and lower it went toward 16,000. From 3:00pm to 3:15pm, the selling increased. At precisely 3:15pm, the buying started. The next 45 minutes were all about buying all by the Fed. The Dow rose more than my prescribed 100 points during those minutes to qualify as a PPT intervention. Good for them. Below is a 2-day chart of the Dow with 15-minute bars so we can memorialize yet another instance of Fed manipulation in the final hour of trading. Notice the abrupt rise in price with the increasing volume in the final 45 minutes. Oops! 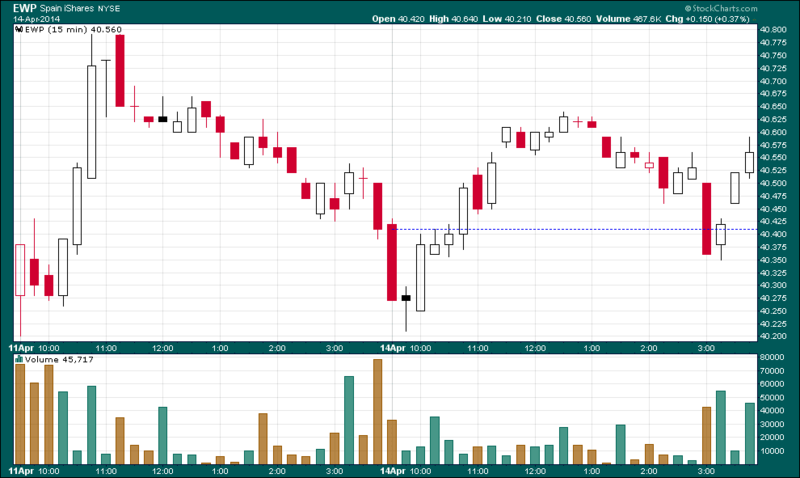 Actually that chart above is a chart of the Spanish ETF, EWP, over the same time horizon. What I am thinking? Spain has an unemployment rate of nearly 30%, daily demonstrations and riots across the country, massive debt, massive housing problems, and no hope of ever returning to real economic growth. Parts of the country are flirting with secession. What could a chart of Spain’s ETF have in common with the Dow? Let’s see the Dow below. Wow! 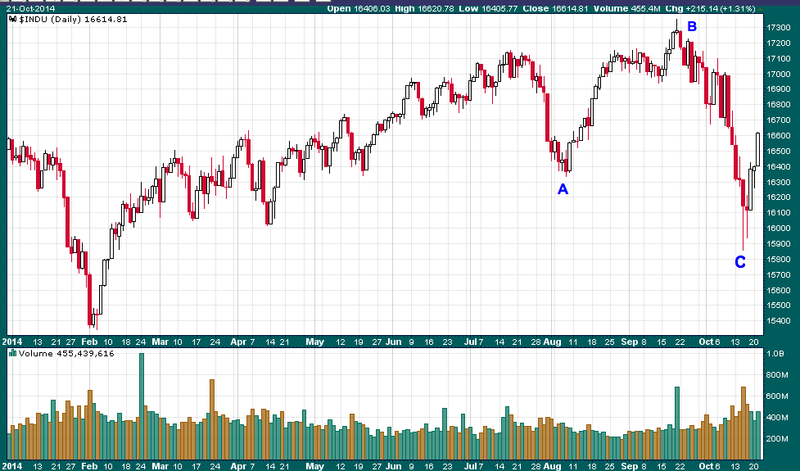 The EWP and the Dow are nearly the same exact chart! Both experienced a nice rally in the final 45 minutes of trading. But that’s the PPT. They buy everything. I’ll bet the Antarctic Index was straight up at 3:15pm as well. The point is this. Does it really matter? Stocks, all stocks, are going to perform as the Fed dictates. Maybe the new rally has therefore started? Who knows? We should ask Ms. Yellen. So, does garbage like Spanish indices rise along with the Dow or is the Dow and the US economy garbage like Spain? In bubbles, garbage rises like everything else. The initial rally came after the regime announced that March retail sales has leapt the most in several years. Of course they did. Someone should tell the idiots at Cold Water Creek. They just announced bankruptcy. Someone should tell the idiots at Radio Shack. They are closing over a thousand stores. Ditto for Family Dollar. Amazingly, retail sales are up without any retailers enjoying any of those sales. Clearly the regime simply writes ‘news’ that supports higher stock prices. Well, good for them. The regime writes what they want us to believe. They claim inflation is non-existent. Yet, gasoline, natural gas, insurance, and taxes are all up. Beef prices are the highest they have been in 30 years. I could go on but this contention is ludicrous. We all know inflation is way up. Even the idiots on the financial networks are talking about the disconnect. But lies make stock prices rise. Let me amplify that point with another regime contention. They claim that women have recovered all job losses since 2008. On the same day, another research group said that the percentage of stay at home moms has increased significantly. Now, how can more women be working when more women are stay at home moms? Okay, let me solve a few riddles that seem to be baffling to most humans. While we are to believe there is no inflation, the guy that sleeps in the White House is proposing an increase in the federal minimum wage. Okay, I won’t even address the preposterous lie that there is no inflation. There is. This is why people can’t live on the current minimum wage. The same can be said for food stamp recipients. As any person trying to live on food stamps can attest, it is hard to buy groceries when prices keep rising. Politicians are trying to propose more money to food stamp recipients. This is all wrong. Why raise the minimum wage? Why increase food stamp pay? Yes, inflation is killing the currency and destroying purchasing power of the currency. But why do people always think in inflationary terms? Rising wages mandated by regime whims will only push prices higher and continue the demise of living standards. No one needs more money. What we all need is lower prices. Why do prices rise all the time? Because the Federal Reserve Bank creates money to give to their bankster conspirators thus stimulating inflation. As Andrew Jackson proved, the abolishment of the Fed Bank results in no inflation. If we want lower prices and no inflation, then we must simply abolish the Fed Bank. Any other conversation is just stupid. The reason this won’t happen is inflation helps the elite who own all the stocks and all the real estate. Deflating prices help the poor and hurt the rich. Since the regime is the puppet of the super elite, prices of everything will continue to inflate. Finally, everyone is wondering what happened to the Malaysian airplane that disappeared last month. Given the criminality of everything that goes on at governmental levels these days, we should consider the following possibility. Let’s just say that a certain regime is desperate to retain power. The regime lies to its subjects about literally everything. The regime runs a spy agency to keep an eye on everyone. Let’s say that there was someone on that Malaysian airplane who had worked with that spy agency. He, and his group were headed to China for some reason. Let’s just say that this group may have known something that the spy agency didn’t want the rest of us to know. Let’s just say that the regime had the capability, you know, with their military being the ‘global force for good’, to blow the airplane out of the sky and then scoop up the debris below. Then to make sure nothing was found, the regime started a game of misdirection. First, we were told there was an Iranian with a stolen passport on board. Can we imagine? An Iranian on an airplane. They’re all terrorists aren’t they? Turns out the guy was just on his way to see his Mom. A few days passed. Okay, then the pilot had erased some files on his computer. Gee, none of the rest of us have ever erased a computer file. A few more days passed. Then a fisherman has spotted some debris off the coast of Malaysia. It wasn’t a plane. A few more days passed. Then some more satellites spotted something floating off the coast of Australia. Nothing. The clock kept ticking. Have the black boxes stopped pinging yet? If not, then there was debris floating towards Hawaii. Maybe it was spotted off the coast of Cuba. Maybe it was off the coast of Chile. Keep looking, people. Some casualties of war are never found. What we know is this airplane took off from Malaysia headed to Shanghai, China. It dropped off radar contact not long after takeoff. Supposedly, the plane flew on for hours after it veered off somewhere in the Indian Ocean. Really? With over 200 people on board, no one noticed that the plane was now way off course? It seems to me that the flight attendants would have notice that something was wrong. It seems to me that business men onboard would have noticed something was wrong. And no one picked up a cell phone to call for help? It seems to me that the NSA tracks everybody’s email, cell call, and underwear change but yet they don’t know what happened to a big old jet plane? Maybe there is a good reason that the entire world is in riot mode against their own government regimes. Maybe we all just want the same thing. The TRUTH!